Raising individual and global consciousness can help us improve personal and collective health, well-being and harmony. We suggest that this begins with people taking greater responsibility for their day-to-day decisions, actions and behaviors, which can result in establishing a new and healthier physiological and psychological internal baseline reference. Establishing a baseline requires having effective and practical strategies available for handling daily situations, making good decisions and taking meaningful and appropriate action. Research also suggests intuition may play an important role in social cognition, decision-making and creativity. When addressing life situations, people often default to familiar patterns of thoughts, feelings and actions in both the decision-making process and how they see others. Rather than responding to situations from habitual patterns that are not necessarily healthy or constructive, those situations could be more effectively addressed with new and creative solutions. These solutions can take into consideration the available inner resources that are congruent with one’s deeper intuition and core values. In other words, we can learn to intentionally align with and access our intuitive intelligence, which can provide moment-to-moment guidance and empower what HeartMath calls heartbased living, reliance in all things on the wisdom, intelligence and qualities of the heart. The origin of the word "intuition" is the Latin verb intueri, which is usually translated as to look inside or to contemplate. Hodgkinson concludes that "intuiting" is a complex set of interrelated cognitive, affective and somatic processes in which there is no apparent intrusion of deliberate, rational thought. He also concludes that the considerable body of theory and research that has emerged in recent years demonstrates that the concept of intuition has emerged as a legitimate subject of scientific inquiry that has important ramifications for educational, personal, medical and organizational decision-making, personnel selection and assessment, team dynamics, training and organizational development. Another comprehensive review of intuition literature yielded this definition of intuition: "Affectively charged judgments that arise through rapid, nonconscious and holistic associations." Several researchers have contended that intuition is an innate ability that all humans possess in one form or another and is arguably the most universal natural ability we possess. They also say the ability to intuit could be regarded as an inherited unlearned gift. [228, 229] A common element also found in most discussions and definitions of intuition is that of affect or emotions. Although intuitions are felt, they can be accompanied by cognitive content and perception of information. Our research and experience suggests that emotions are the primary language of intuition and that intuition offers a largely untapped resource to manage and uplift our emotions, daily experience and consciousness. The second type of intuition is what we call energetic sensitivity, which refers to the ability of the nervous system to detect and respond to environmental signals such as electromagnetic fields (also see Energetic Communication section). It is well established that in both humans and animals, nervous-system activity is affected by geomagnetic activity. Some people, for example, appear to have the capacity to feel or sense that an earthquake is about to occur before it happens. It has recently been shown that changes in the earth’s magnetic field can be detected about an hour or even longer before a large earthquake occurs. Another example of energetic sensitivity is the sense of being stared at. Several scientific studies have verified this type of sensitivity. The third type of intuition is nonlocal intuition, which refers to the knowledge or sense of something that cannot be explained by past or forgotten knowledge or by sensing environmental signals. It has been suggested that the capacity to receive and process information about nonlocal events appears to be a property of all physical and biological organization and this likely is because of an inherent interconnectedness of everything in the universe. [235-237] Examples of nonlocal intuition include when a parent senses something is happening to his or her child who is many miles away, or the repeated, successful sensing experienced by entrepreneurs about factors related to making effective business decisions. 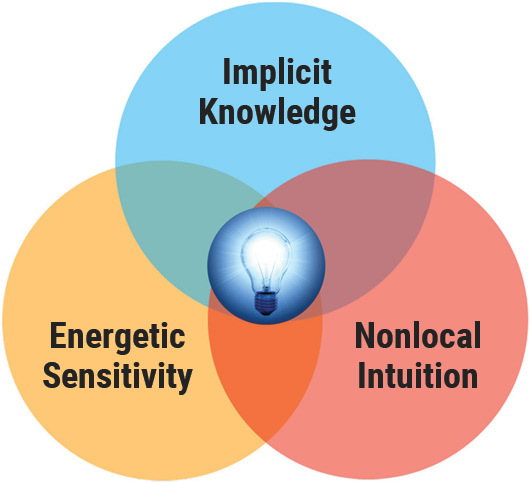 Figure 7.1 The three types of intuition. The question of how intuition interacts with deliberate, conscious thought processes, has long been the subject of debate. Research in the fields of cognitive and social psychology has produced the commonly accepted dual-process theory, which suggests there are two separate processing systems. The first system is unconscious, automatic and intuitive. It processes information very rapidly and associates current inputs to the brain with past experiences. Therefore, it is relatively undemanding in its use of cognitive resources. For example, when individuals have gained experience in a particular field, implicit intuitions are derived from their capacity to recognize important environmental cues and rapidly and unconsciously match those cues to existing familiar patterns. This results in rapid and effective diagnosis or problem-solving. In contrast, the second processing system is conscious in nature, relatively slow, rule-based and analytic. It places greater demands on cognitive resources than the first system. The term intuition also is used commonly to describe experiences scientific literature refers to as insight. When we have a problem we cannot immediately solve, the brain can be working on it subconsciously. It is common when we are in the shower, driving or doing something else and not thinking about the problem that a solution pops into the conscious mind, a process we experience as an intuitive insight. This type of implicit process involves a longer gestation period following an impasse in problem-solving before a sudden insightful perception or strategy that leads to a solution. In contrast, intuition in the dual-processing models of implicit intuition described above occurs almost instantaneously and is emotionally charged. The study of nonlocal intuition, which at times has been thought of as being in the same category as telepathy, clairvoyance and precognition, has been fraught with debate in the scientific community. While there are various theories that attempt to explain how the process of intuition functions, these theories have yet to be confirmed, so an integrated theory remains to be formulated. Nevertheless, there is now a large body of documented rigorous scientific research on nonlocal intuitive perception that dates back more than seven decades. A variety of experiments show it cannot be explained by flaws in experimental design or research methods, statistical techniques, chance or selective reporting of results. A meta-analysis of nine experiments that measured physiological responses occurring before a future event (pre-stimulus responses) that could not otherwise be anticipated through any known inferential process, revealed statistically significant results in eight of the nine studies in over 1,000 subjects. Subsequent to this, a researcher, by examining 26 studies, also concluded that a clear pre-stimulus response in physiological activity occurred before unpredictable stimuli, despite the fact there is not yet any known explanation of the mechanisms for this finding. Figure 7.2 The heart’s pre-stimulus response. The graph shows group averages of the heart rate variability (blue and red lines) and skin conductance level (pink and green lines) responses. The "0" time point denotes when the photos were first shown, when participants saw either an emotionally arousing or calm picture. Pre-stimulus responses which indicate nonlocal intuition are in the period between -6 and 0 seconds. The red line is the HRV trace when the future photo was an emotional one, and the blue line shows the HRV for calming future photos. The highly significant difference between the HRV responses in the pre-stimulus period before the future calm or emotional photos can clearly be seen starting to diverge approximately 4.8 seconds prior to the participants actually seeing the photos. Extending and building on Radin’s protocol designed to evoke an emotional response using randomly selected, emotionally arousing or calming photographs, we added measures of brain response (EEG) and heart-rhythm activity (ECG) and found that not only did both the brain and heart receive the pre-stimulus information some 4 to 5 seconds before a future emotional picture was randomly selected by the computer, the heart actually received this information about 1.5 seconds before the brain received it (Figure 7.3). Figure 7.3 Example of temporal dynamics of heart and brain pre-stimulus responses. This overlay plot shows the mean event-related potential (ERP) at EEG site FP2 and heart-rate deceleration curves during the pre-stimulus period. (The "0" time point denotes stimulus onset.) The heart-rate deceleration curve for the trials, in which a negative emotionally arousing photo would be seen in the future, diverged from that of trials containing a calming future picture (sharp downward shift) about 4.8 seconds before the stimulus (arrow 1). 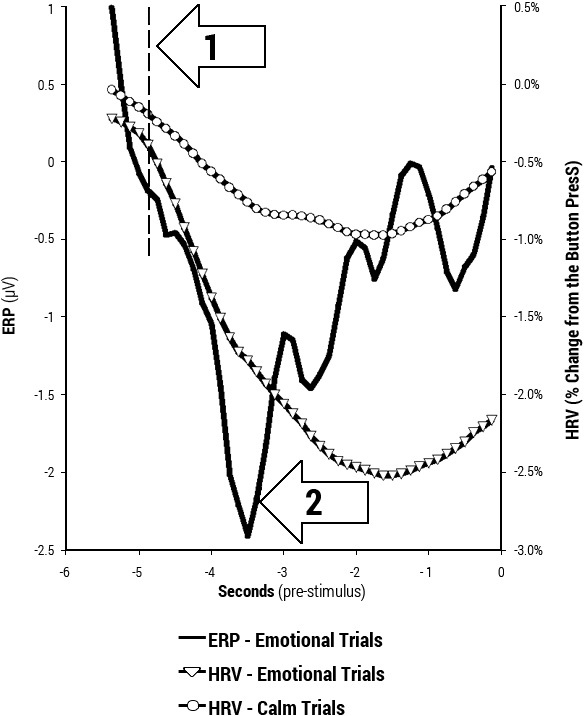 The emotional trials ERP showed a sharp positive shift about 3.5 seconds before the stimulus (arrow 2). This positive shift in the ERP indicates when the brain "knew" the nature of the future stimulus. The time difference between these two events suggests that the heart received the intuitive information about 1.3 seconds before the brain. Heartbeat-evoked potential analysis confirmed that a different afferent signal was sent by the heart to the brain during this period. A number of studies have since found evidence of the heart’s role in reflecting future or distant events. [245-251] Using a combination of cortical-evoked potentials and heartbeat-evoked potentials, these studies also found that when the participants were in the physiological coherence mode before the trials, the afferent input from the heart and cardiovascular system modulated changes in the brain’s electrical activity, especially at the frontal areas of the brain. In other words, participants were more attuned to information from the heart while in a coherent state before participating in the experimental protocol. Therefore, being in a state of psychophysiological coherence is expected to enhance intuitive ability. This suggests the heart is directly coupled to a source of information that interacts with the multiplicity of energetic fields in which the body is embedded. We also found further evidence that the magnitude of prestimulus response to a future event is related to the degree of emotionality associated with that event. A study conducted in Iran with a group of 30 repeat entrepreneurs in the science and technology parks of the city of Tehran duplicated and extended our first study of intuition. Repeat entrepreneurs were chosen for this study because they are most likely to have demonstrated that their success is not the result of luck alone and they have beaten the odds against success. Also, studies have shown that they have a strong tendency to rely on their intuitions when making important business decisions. 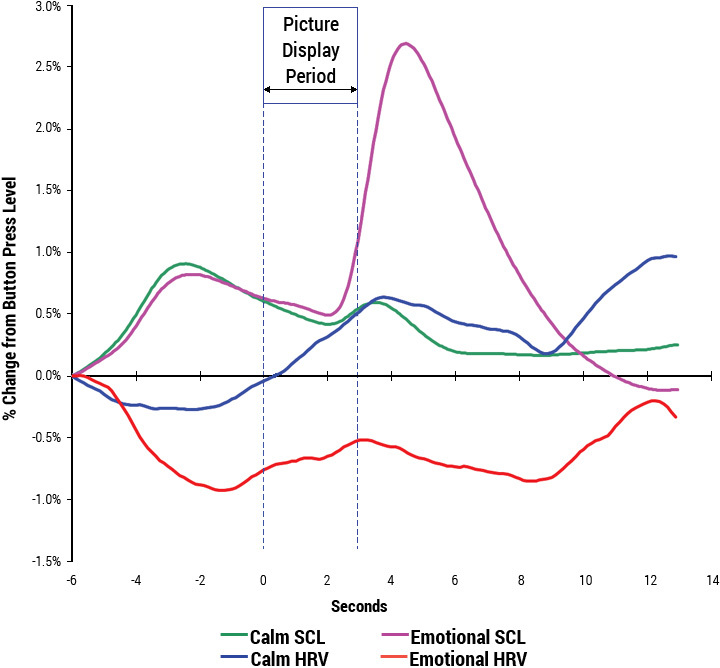 The study was modeled after our study, described above, whose stimulus was a computer-administered random sequence of calm and emotional pictures. However, this study added a new element: Researchers conducted two separate experiments. The first, with a group of single participants (N = 15), and the second, with a group of co-participant pairs (N = 30), investigated the "amplification" of intuition effects by social connection. In the experiment for single participants, the participant watched the pictures on a monitor alone, while in the experiment for co-participant pairs, each pair watched the same pictures simultaneously on two monitors while sitting facing each other, as illustrated in Figure 7.4. Figure 7.4 Setup for Single Participant Experiment and Co-participant Pair Experiment. Each experiment was conducted over 45 trials while heart-rate rhythm activity was recorded continuously. In both experiments, the results showed significant pre-stimulus results, meaning for the period before the computer had randomly selected the picture stimulus. Moreover, while significant separation between the emotional and calm HRV curves was observed in the single-participant experiment, an even larger separation was apparent for the experiment with co-participant pairs, and the difference between the two groups also was significant. Overall, the results of the single-participant experiment confirm our and others’ previous finding that electrophysiological measures, especially changes in heart rhythm, can demonstrate intuitive foreknowledge. This result is notable because, having come from experiments in Iran, it constituted cross-cultural corroboration in a non-Western context. In addition, the results for coparticipant pairs offer new evidence on the amplification of the nonlocal intuition signal. We also evaluated an updated version of a roulette protocol we developed that includes two pre-stimulus segments. This study included an analysis of individual data analysis and group-level data analysis for 13 participants over eight separate trials. We also assessed the potential effects of the moon phase on the pre-stimulus response outcomes and participant winning and amount-won ratios. Half of the experimental sessions were conducted during the full-moon phase and half during the new-moon phase. Within each trial, a total of three segments of physiological data were assessed. There were two separate prestimulus periods, a pre-bet (4-seconds) and post-bet (12-seconds), and a post-result period (6-seconds). Participants were told they were participating in a gambling experiment, given an initial starting kitty and informed that they could keep any winnings over the course of 26 trials for each of the eight sessions. The physiological measures included the ECG, from which cardiac interbeat intervals (HRV) were derived and skin conductance. Overall, the results indicate the protocol provides an effective objective method for measuring and detecting a pre-stimulus response, which demonstrates a type of nonlocal intuition. We found significant differences between the win and loss responses in the aggregated physiological waveform data during both pre-stimulus segments (Figure 7.5). On average, we detected a significant pre-stimulus response starting around 18 seconds before participants knew the future outcome. Interestingly, there was not a strong overall relationship between the pre-stimulus responses and the amount of money the participants won or lost. We also found a significant difference in both pre-stimulus periods during the fullmoon phase, when they also won more money, but not in the new-moon phase (Figure 7.6). Overall, the findings also suggest that if participants had been able to become more attuned to their internal cardiac related pre-stimulus responses, they would have performed much better on the betting choices they made. Figure 7.5 Multisession roulette paradigm study. 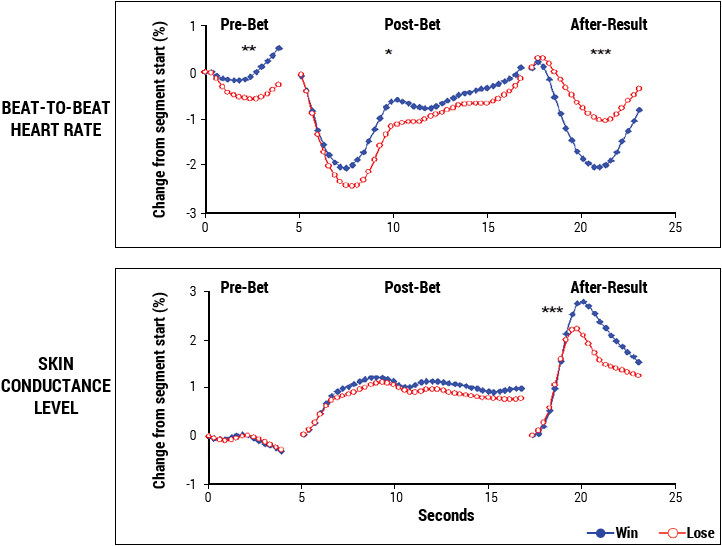 Grand averages are shown for the skin conductance levels and HRV win/loss waveform differences in response to winning or losing for all 13 participants across all eight trials for the three segments of the experiment: pre-bet, post-bet and post-result periods. * = (p < 0.05), ** = (p < 0.01), *** = (p < 0.001). Figure 7.6 Multisession roulette paradigm study. Shown are grand averages by moon phase for the skin conductance levels and HRV win/loss waveforms results. 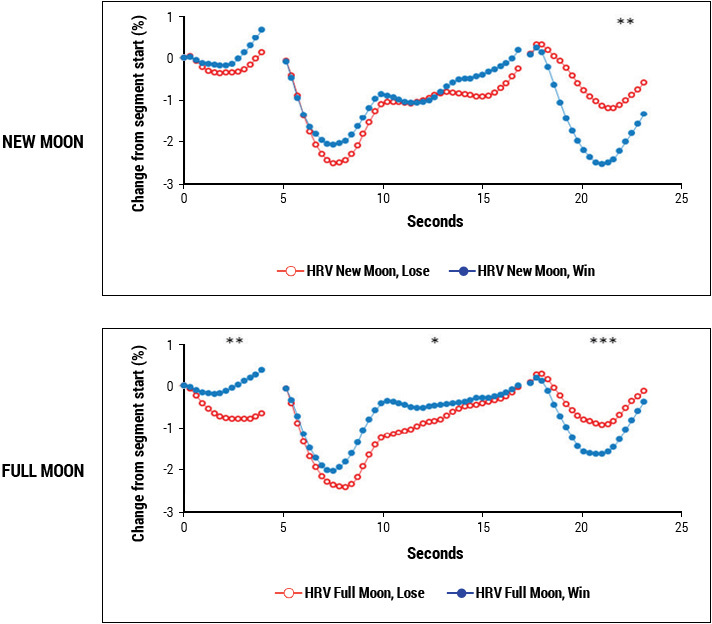 There was a significant difference in the HRV win/loss waveforms in both the pre-bet (p < 0.01) and post-bet (p < 0.05) periods during the full-moon phase and no significant difference during the new-moon phase. * = (p < 0.05), ** = (p < 0.01), *** = (p < 0.001). Because the heart plays a central role in creating physiological coherence and is associated with heartfelt positive emotions and intuition, it is not surprising that one of the strongest threads uniting the views of diverse cultures and religious and spiritual traditions throughout history has been a universal regard that it is the source of love, wisdom, intuition, courage, etc. Everyone is familiar with such expressions as "put your heart into it," "learn it by heart" and "speak from your heart." All of these suggest an implicit knowledge that the heart is more than a physical pump that sustains life. Such expressions reflect what often is called the intuitive, or spiritual heart. Throughout history, people have turned to the intuitive heart – also referred to as their inner voice, soul or higher power – as a source of wisdom and guidance. As discussed in the Heart-Brain Communication chapter of this work, the physical heart has extensive afferent connections to the brain and can modulate perception and emotional experience. Our experience suggests that the physical heart also has communication channels connecting it with the energetic heart. Nonlocal intuition, therefore, is transformational, and from our perspective, it contains the wisdom that streams from the soul’s higher information field down into the psychophysiological system via the energetic heart and can inform our moment-tomoment experiences and interactions. At HeartMath Institute, this is what we call heart intelligence. Heart intelligence is the flow of higher awareness and the intuition we experience when the mind and emotions are brought into synchronistic alignment with the energetic heart. When we are heart-centered and coherent, we have a tighter coupling and closer alignment with our deeper source of intuitive intelligence. We are able to more intelligently self-regulate our thoughts and emotions and over time this lifts consciousness and establishes a new internal physiological and psychological baseline. In other words, there is an increased flow of intuitive information that is communicated via the emotional energetic system to the mind and brain systems, resulting in a stronger connection with our deeper inner voice. Although people’s degree of access to the heart’s intuition varies, we all have access to the three types of intuition. As we learn to slow down our minds and attune to our deeper heart feelings, a natural intuitive connection can occur. Intuition often is thought of in the context of inventing a new lightbulb or winning in Las Vegas, but what most people discover is that intuition is a very practical asset that can help guide their moment-to-moment choices and decisions in daily life. Our intuitive insights often unfold more understanding of ourselves, others, issues and life than years of accumulated knowledge. It is especially helpful for eliminating unnecessary energy expenditures, which deplete our internal reserves, making it more difficult to self-regulate and be in charge of our attitudes, emotions and behaviors in ordinary day-to-day life situations. Intuition allows us to increase our ability to move beyond automatic reactions and perceptions. It helps us make more intelligent decisions from a deeper source of wisdom, intelligence and balanced discernment, in essence increasing our consciousness, happiness and the quality of our life experience. This increases synchronicities and enhances our creativity and ability to flow through life. It also increases our ability to handle awkward situations such as dealing with difficult people with more ease and it promotes harmonious interaction and connectivity with others. It is important to understand that conscious awareness of anything, including our emotions and intuitive promptings, is not possible until something has captured our attention. Sensory neurons in our eyes, ears, nose and body are continuously active day and night, whether we are awake or asleep. The brain receives a steady stream of information about all the events the sensory systems are detecting. It would be bewildering if we were continuously aware of all the incoming information from both our external and internal environments. In fact, we completely ignore most of the information arriving to the brain – most of the time. It is when inputs are large, sudden or novel or lead to an emotional reaction that they capture and focus our attention and that we become aware of them. Voluntary attention, on the other hand, describes the process in which we can consciously self-regulate and determine the contents of our own awareness as well as the duration of our focus. Current evidence suggests that this self-regulatory capacity relies on an inner resource akin to energy, which is used to interrupt the stream of consciousness and behavior and alter it. When this limited energy has been depleted, further efforts at self-regulation are less successful than usual. With practice, however, the capacity to self-regulate can be increased and give us more energy resources to sustain self-directed control. Importantly, these practices also are keys to establishing a new baseline and once a new baseline is established, the new patterns of self-regulation become automatic and therefore do not require the same energy expenditure. One of the most important keys to accessing more of our intuitive intelligence and inner sense of knowing is developing deeper levels of self-awareness of our more subtle feelings and perceptions, which otherwise never rise to conscious awareness. In other words, we have to pay attention to the intuitive signals that often are under the radar of conscious perception or are drowned out by ongoing mental chatter and emotional unrest. A common report from people who practice being more self-aware of their inner signals is that the heart communicates a steady stream of intuitive information to the mind and brain. In many cases, we only perceive a small percentage of intuitive information or choose to override the signals because they do not match our more egocentric desires. Given that there is a relationship between increased heart coherence and access to intuitive signals, the capacity to shift into a coherent state is an important factor in the three types of intuition: implicit knowledge/learning, energetic sensitivity and nonlocal intuition. The research discussed above suggests it’s possible to access intuitive intelligence more effectively by first getting into a coherent state, quieting mental chatter and emotional unrest and paying attention to shifts in our feelings, a process that brings intuitive signals to conscious awareness. We have found that increased heart-rhythm coherence correlates with significant improvements in performance on tasks requiring attentional focus and subtle discrimination. We’ve also found that heart-rhythm coherence correlates with pre-stimulus-related afferent (ascending) signals from the heart to the brain. It is likely that these signals are important elements of intuition that are particularly salient in pattern recognition and that they are involved in all types of intuitive processes. The Freeze Frame Technique,[179, 182] is a five-step process that was designed for improving intuitive capacities, stopping energy drains, shifting perspective, obtaining greater clarity and finding innovative solutions to problems or issues.